Have you carefully red the page where we introduced ourselves? When there are no power cuts (very frequent in Myanmar), light is switched on in the room we used to sleep in at 4am As it is still complete darkness at that time of the night if there is no electricity, we have to light on candles. 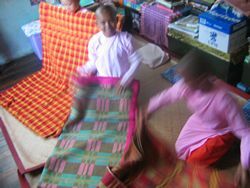 As soon as we wake up, to make room, we fold up the blankets and roll the mats on which we have slept. The monastery where we live in is not huge and we are many nuns living there. That is why the room where we sleep in becomes during the day the place where we study. 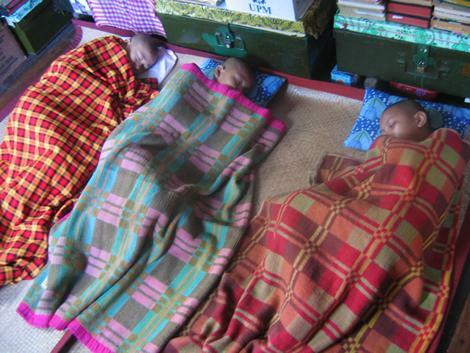 When we have tidied up our mats and blankets we freshen up. 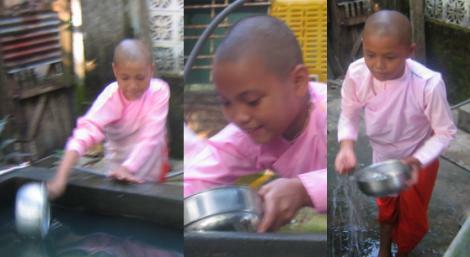 We wash our faces with cold water and we brush our teeth. In fact it is complete darkness till 5 a.m. We have done some things again, later in the day, so that you can see well. With the flash pictures do not look like natural. It is very nice to have water on your face early in the morning. It gives energy. The washing finished, we put our top dresses. We sleep with a monastic dress which we use as underwear. Each nun’s dress is in fact made up with a collection of pieces of pink or orange cloth (these colours can change from a country to another). As soon as we are ready, we go into the big room where the statues of Buddha are. 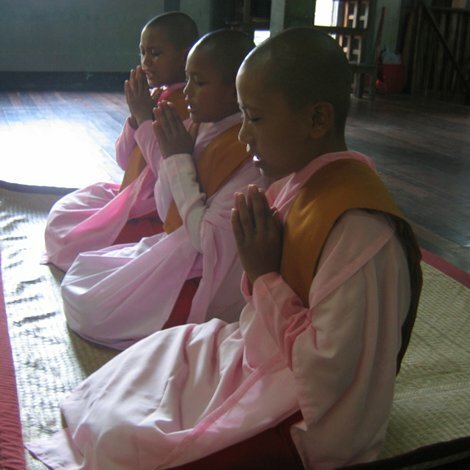 We respectfully sit down, the feet backwards, the hands put together and we recite some suttas in pali. At this moment, we have not yet eaten because we must wait dawn. 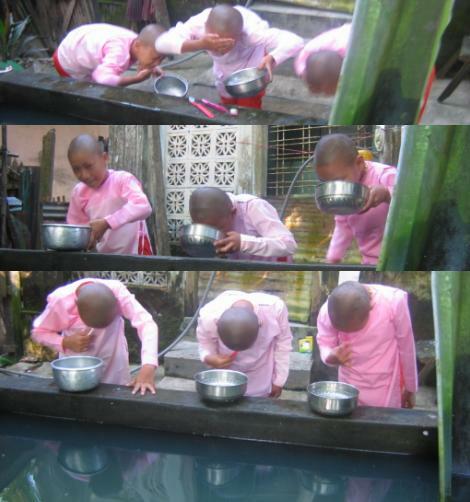 In fact we are nuns because we agreed to follow scrupulously the eight precepts. These are eight things which we have renounced in order to maintain a good virtue. There are people who prefer storing up a lot of money. But for us, to practise having a good virtue, to be happy even when you have nothing and to show kindness towards anyone, that is the real wealth. These precepts help us having a very clear mind which makes study and meditation easier for us. 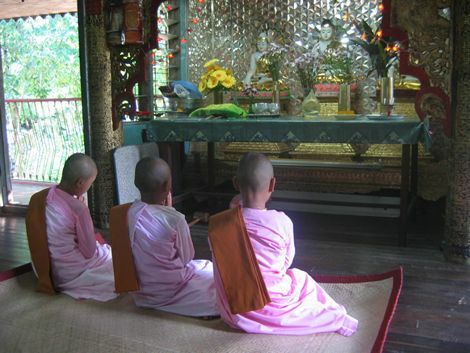 For more details about the precepts, you can consult the page of the five precepts. People often think that it is a big constraint because they only see that, as a privation of all sorts of pleasures, on the contrary we think that it is the best way to limit to the minimum the problems of life, to clearly understand reality and to be satisfied with a little wherever we are. 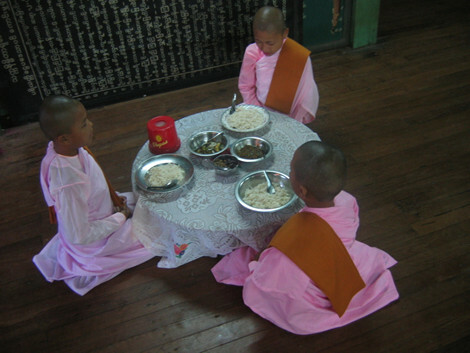 We eat more or less the same thing: especially rice which is the basic food in Myanmar, with two or three different meals. In the morning, the rice is cold and it is generally embellished with sour vegetables or with a spicy sauce. Before we begin to eat, we always pronounce few words for the attention of people who generously gave us the food.